In 1969, Frank Zappa heard The Persuasions singing live over the phone in a New Jersey record shop, picked his jaw up off the ground and promptly flew the group to Los Angeles to record their first album “A Cappella”. Thus began a 25-album recording career that focused on R&B, Soul, Pop, Rock ‘n’ Roll, but eventually included full album tributes to Frank Zappa, The Grateful Dead and The Beatles. The group even recorded a children’s album, “On The Good Ship Lollipop,” winner of many parents’ group awards. Through it all, The Persuasions’ sound was crowned by Jerry Lawson’s sweet and smoky lead baritone, (which began as a tenor), his effortlessly organic vocal arrangements, and his electrifying stage charisma. Critics often place Lawson’s inspired phrasing in a context with Sam Cooke, Brook Benton, and Otis Redding. Following their Straight album, The Persuasions signed with Capitol and recorded three of the most arresting vocal albums ever made: We Came to Play, Spread the Word, and Street Corner Symphony. They covered tunes by Bob Dylan, Sam Cooke, Kurt Weill, Curtis Mayfield, The Temptations, Joe South, Rogers and Hammerstein, Lennon and McCartney. This eclectic mix of material and genre was a direct reflection of Lawson’s taste in music, and became a template for the many Persuasions albums that were to follow, culminating in the 1990’s with a gospel album, a children’s album, and acclaimed tribute albums to Frank Zappa, The Beatles, and The Grateful Dead. These were singers in the tradition of great gospel A Cappella groups such as The Golden Gate Quartet and The Fairfield Four, but the Persuasions advanced the art form into a percolating, pulsing, street-edged meld of rock ‘n’ roll, soul, country, blues. . .In short, they “Persuasionized” any songs that suited them, and made them their own—from “Papa Oom Mow Mow” (heard in “E.T.”) to “Curtis Mayfield’s “Man Oh Man” to Kurt Weill’s “Oh Heavenly Salvation.” Lawson adapted a huge range of popular music to A Cappella style, with his own original arrangements, and co-produced Persuasions and recordings. He was an electrifying front man who also had the gift of gab. Some of his between-song patter was simply great stand-up comedy. The other members of the group all made vital contributions to the unique Persuasions sound. Jimmy Hayes’ silky bass-singing was and is without peer in all Contemporary A Cappella history—perhaps all A Cappella history. “Sweet Joe” Russell’s mighty harmonies and occasional leads were essential to the overall Persuasions sound. Jayotis Washington’s elastic tenor provided contrast on occasional novelty tunes, and Toubo Rhoad’s “invisible” baritone sort of held the proceedings together. Though discovered by college radio in the early ’70s, championed by Barry “Dr. Demento” Hansen (who had them record his theme song), they got little more than token FM airplay on the west coast in the ’70’s, while in New York they were being played constantly by Frankie Crocker on WBLS. Their albums were often wrongly relegated to “Doo Wop” and “oldies” bins in record stores. Still, they carried on, building a deeply devoted audience and touring the world. Their live performances remain the stuff of legend (thankfully borne out by various audience recordings and Wolfgang’s Vault shows.) Incredibly, Bruce Springsteen opened for The Persuasions on more than one occasion. In 1979 The Persuasions became an integral part of Joni Mitchell’s legendary “Shadows and Light” tour. 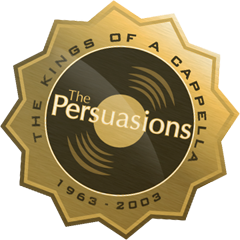 Throughout the 60s, 70s, and most of the 80s, The Persuasions preached the A Cappella gospel almost entirely alone—certainly the secular, eclectic A Cappella gospel. Although they didn’t know it, they had created the genre that is today known as Contemporary A Cappella.